Love Yo Gabba Gabba? 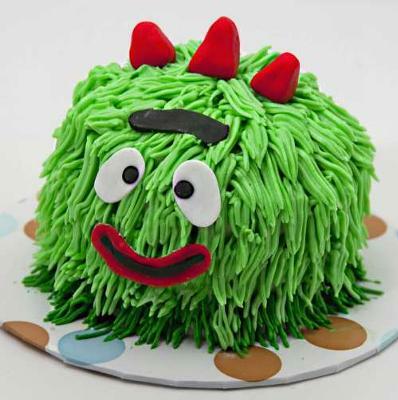 Here is a cute cake and some cool party ideas for a Yo Gabba Gabba fan! The cake was a devils food cake with chocolate buttercream icing. The fondant used on the cake was homemade marshmallow fondant. Each character was drawn out ahead of time and then created out of gumpaste. 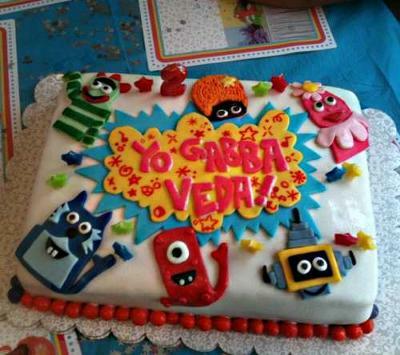 My daughter, the birthday girl's name is Veda Blu so we customized the cake to say Yo Gabba Veda instead of Yo Gabba Gabba. All of the party favors, balloons, cake plates and napkins were Yo Gabba Gabba themed, and we even had a customized Yo Gabba Gabba banner with Veda's picture on it made for the party. We served Brobee pizza and had Dazzleberry lemonade like they do on the show. We played Yo Gabba Gabba music in the background of the party and had the show (on mute) on repeat on or TV. It was a Yo Gabba Gabba dream party for a two year old! This is definitely a dream party for any young child! Thanks for sharing all the wonderful party ideas. I love how you personalized the cake for your daughter. Join in and write your own page! It's easy to do. How? Simply click here to return to Birthday Cakes. 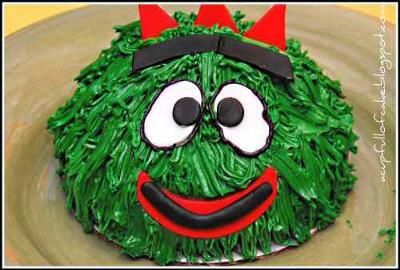 Looking for some cool Yo Gabba Gabba Cakes? 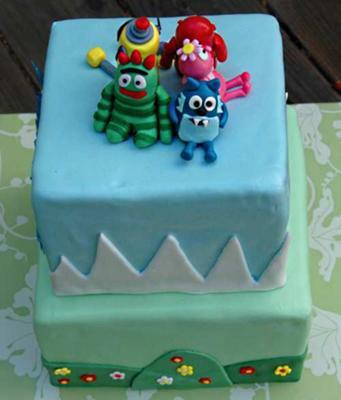 Here's a fabulous Brobee Smash cake that will delight any 1 year old! Or see this cool fondant cake with all your favorite Yo Gabba Gabba characters. The first cake is a 4" smash cake, banana with vanilla icing in the shape of Brobee with icing hair and fondant details. The second is a chocolate mud cake filled with chocolate whipped ganache and lemon cake filled with berries and whipped cream, all covered in fondant and decorated with hand modeled figures. These pictures were graciously shared by Jenny. Be sure to check out her Facebook Page to see other cool cake ideas! 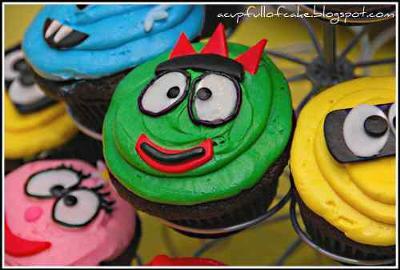 Cute Yo Gabba Gabba cupcakes with all the main characters, Brobee, Plex, Toodee, Foofa and Muno. These cupcakes were made with Chocolate cake, vanilla swiss meringue butter cream frosting. The cute faces were made with fondant decor. Great for young children. Each can enjoy their favorite character from the show. 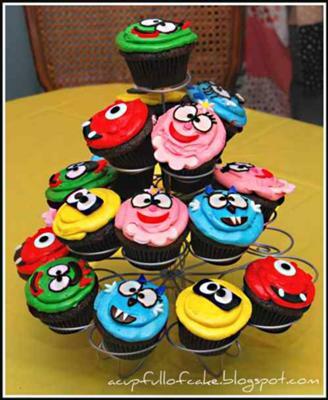 You could also make a Brobee matching cake to got with these sweet cupcakes. The Brobee cake is also made with Chocolate cake, vanilla swiss meringue butter cream frosting, and the features are made with fondant decor. This was graciously shared by Shanna. Please be sure to check out her Blog for some wonderful creations. Thank you for sharing these wonderful cupcakes and Brobee cake! 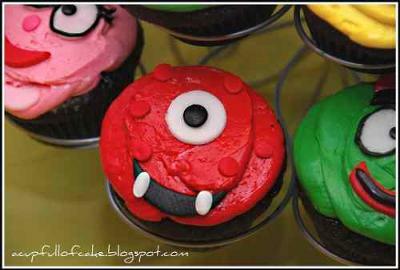 I know little Yo Gabba Gabba fans will love these party ideas. The Brobee looks like it would make a great smash cake for a 1 year old and the guests could enjoy the cupcakes.